Italian Ravioli with tomato and basil sauce. 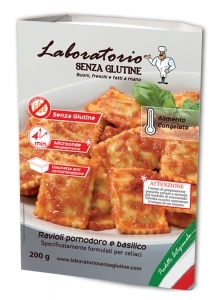 Handmade pasta with no gluten and no preservatives. Tomato 30%, rice flour, ricotta cheese 11% (buttermilk, salt, acidity regulator, citric acid, lactic acid), potato starch, rice starch, egg, spinach 7%, corn starch, extra virgin olive oil, onion, guar flour (E412), salt, basil 0,1%.